Fall is officially here and we've already had snow. If you're not yet done with your fall maintenance list, get on it. We post this same fall maintenance list every year, and we modify it just a bit every year with new and updated information. This year, I created three new video clips to accompany the list. Disconnect any garden hoses. If they're left attached, even to a frost-free faucet, you have the potential for a burst pipe. Drain the water out of your faucets. 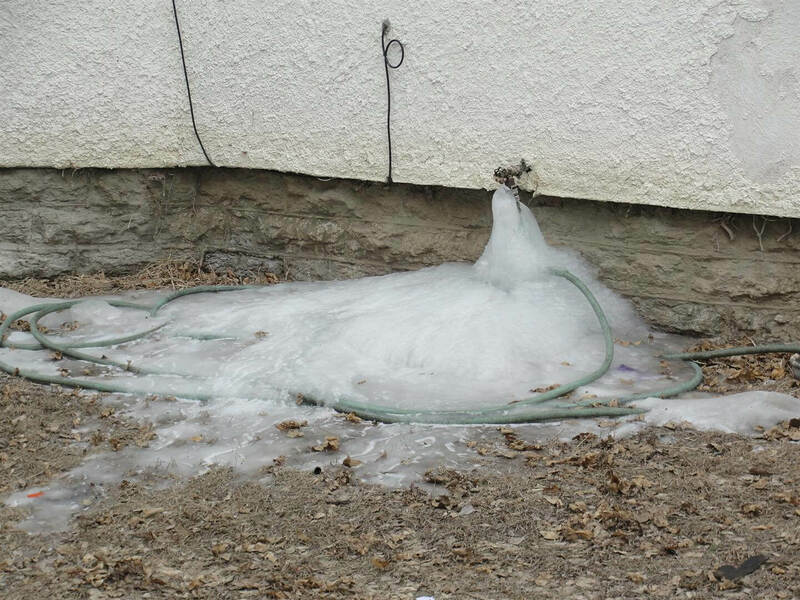 See How to Prevent Your Outside Faucets from Freezing. Remove any pond pumps and store the pump in your basement in a 5-gallon bucket filled with water. This will help to prevent the seals from drying out. If you have a utility sink in your garage, drain the water out of the pipes and dump some RV anti-freeze into the drain. If you have a lawn sprinkler system (aka "irrigation system") it needs to be drained and blown out with compressed air. Hire a pro to do this. Side note: If you hire a pro and they try to tell you that your existing system also needs to have the backflow preventer tested, please check out what the real requirements are for yourself: New backflow preventer testing requirements for Minnesota. Only new installations must be tested annually. If an air exchange system is present, such as a heat recovery ventilator (HRV) or energy recovery ventilator (ERV), clean it. Regular maintenance items for an HRV include cleaning the exterior intake, the filters, and the core. See HRV maintenance. Clean the clothes dryer duct. The damper at the exterior should move freely and close properly. See dryer duct maintenance. 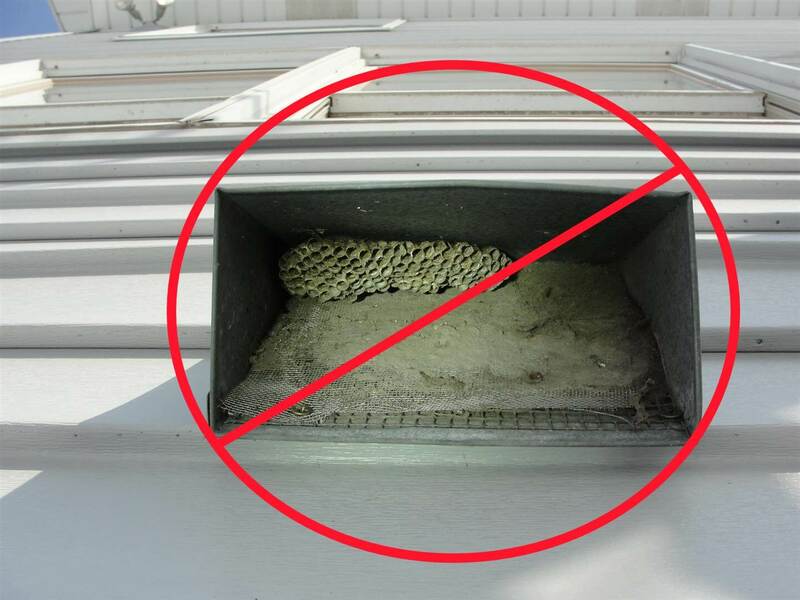 Check the bathroom and kitchen exhaust dampers for wasp nests. Nests in these terminals will prevent the dampers from openings. See Bath Fan Terminal Inspections. Clean the soffit vents. These can get clogged up with lint, dust, insulation, and paint. They’re located under the roof overhangs. Check the roof vents for bird nests. They can typically be seen from the ground. If the downspouts or sump pumps drain into an underground system, re-direct them to drain to the ground surface when feasible. See Sump Pump Discharge. If the furnace or water heater vent blows exhaust gas onto the air conditioner, a plastic cover can be used to shield the air conditioner from the corrosive exhaust gases. Don’t cover heat pumps. Heat pumps are not common in Minnesota. Seal any gaps around the home 'envelope'; check for loose or dried-out caulking around pipes, ducts, faucets, air conditioner refrigerant lines, etc. While this is the most generic piece of fall maintenance advice, it's still smart to do this before winter. Smoke alarms should be located inside every bedroom, and one in a common area on every level. If you don't have photoelectric smoke alarms in your home, add them. This is a big deal. If you don't know what type you have, you probably don't have photoelectric. CO alarms should be located within ten feet of every sleeping room, but not in furnace rooms, kitchens, or garages. Replace the batteries in your smoke alarms and carbon monoxide alarms and test them using the built-in test buttons. Check the age of your smoke and CO alarms; smoke alarms are good for up to ten years, CO alarms are good for between five and ten years. If they’re any older, replace them. Have a professional furnace or boiler tune-up performed annually. See Are Annual Furnace Inspections Really Necessary? Replace the batteries in your thermostat. If your thermostat fails while you're on vacation, you might come home to a winter wonderland. Clean or replace the furnace filter. This should usually be done every one to three months, depending on the type of filter. The arrow on the filter should point toward the furnace. Have the flues professionally cleaned on any wood burning fireplaces if they get used regularly; every 30 - 50 fires is a good rule of thumb. Clean the dust out of the bottoms of any gas fireplace inserts. If you have a gas log installed in a wood burning fireplace with an adjustable damper, make sure there is a damper stop installed to prevent the damper from getting closed all the way. See My Beef With Old Gas Log Fireplaces.